Are you in the market for a glorious new Saturday-afternoon pastime? 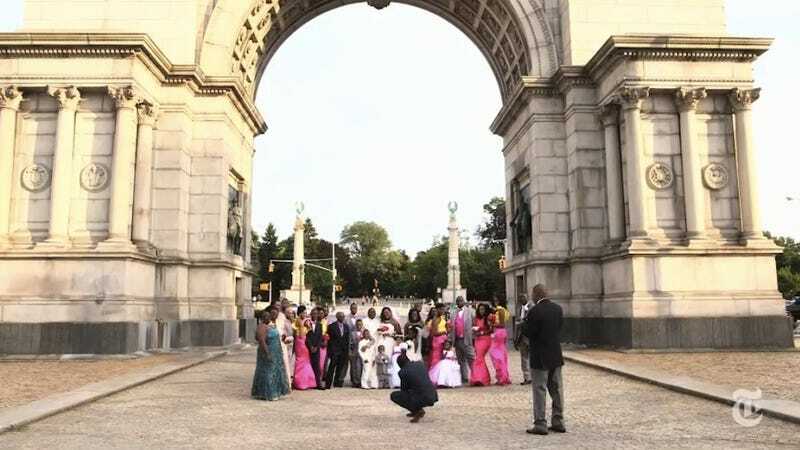 Then consider the example of 79-year-old Rhoda Hill, who spends her summer Saturdays at Brooklyn's Grand Army Plaza, watching as happy couples take wedding photos. Since the 70s Ms. Hill has been spectating at the Plaza, which is a popular spot for photos thanks to the picturesque arch and fountain. At one point she had a crew of 25 fellow wedding watchers. Over the years many have died or moved away, but she still comes, bringing a picnic lunch and enjoying the breeze. "It's a happy occasion," she explained. "It's a beautiful thing, seeing two people starting their lives together."